Not the kind to clean our clothes, the kind we sew with. There is also a bonus twofer TTT at the end! These little beauties come in so many sizes and thicknesses, but cost only pennies a piece. I think the largest one I have was 31 cents and some were even free, because...let me hear it ladies...I stole (borrowed) them from my husband!! Remember when you borrow anything from your hubbies, please wash the grease off first. These little circles are great templates for making yo yos, especially the thicker ones, because they are easy to trace around. 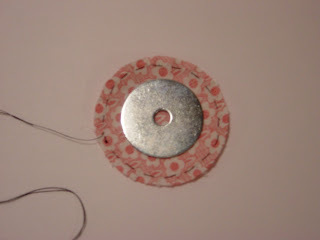 The thinner ones make wonderful circles for applique. I will try and attempt a tutorial below, but bare with me on some of the photos...they're a little blurry. 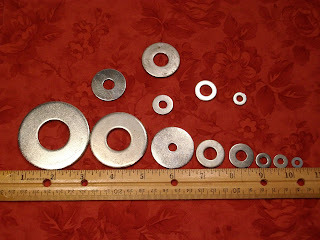 Here is just a small selection of the washers I found. Isn't that smallest one the cutest thing. I think it's 1/4". These next 2 (very dark) photos show the thickness. This is great for tracing. 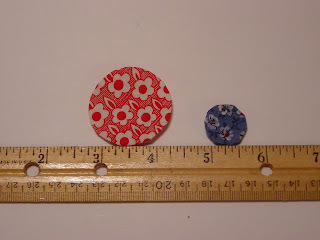 and the thin one on the left could be for tracing or making circles for applique. 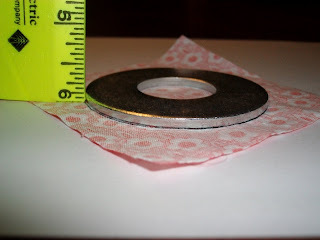 Choose the size washer that you want your finished circle to be. Try and make it a thin one. Then pick a larger one for your template. My template is a 1/2" larger than the size I want my circle to be. 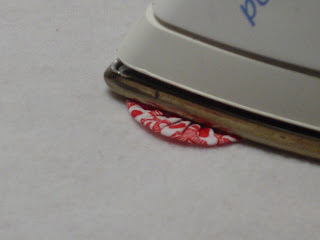 Place large template washer on wrong side of fabric. Trace with marker or pencil. 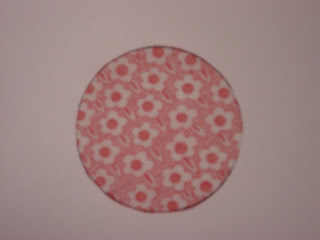 Cut out circle...I know simple so far. 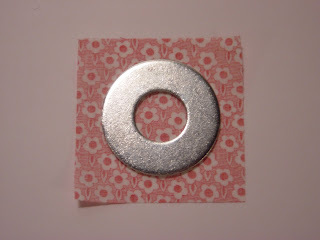 With matching thread that is knotted at the end (I used black so you can see it), sew a running stitch around the circle about a 1/4" from the edge. Leave the thread long. You will need this to pull up the gathers. 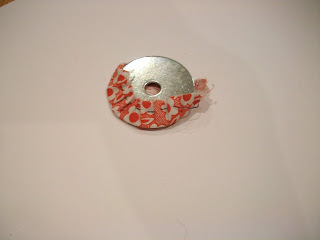 Place the thin washer that you want the finish size to be on the fabric. Press with a hot (steam) iron. You may want to use a spray starch to really set the shape. Let it cool for a second (it's hot metal), then carefully open up the gathers just enough to pull out the washer. Reposition the shape of the circle again. This is where the starch will help. 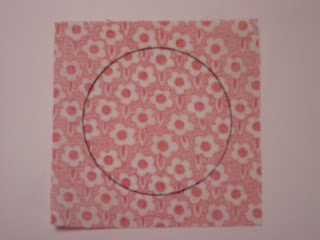 and here you are...a cute little circle all ready to applique on your favorite quilt! 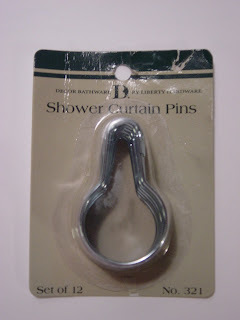 The holder for all your washers...a shower curtain ring!! Have a great Tuesday everyone and I'll see you in the hardware store...I'm the one with thread hanging off the back of my pant leg wearing my fancy little apron!!! That is just clever! 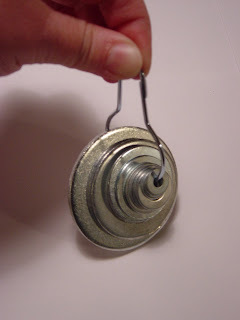 And who ever thought washers could be so cute...hanging there on your peg board. I need some of those. I use them in another way......sew them inside a tiny piece of batting and put them inside the poly-fill that I use to stuff homemade pincushions! I love your idea for hanging them and keeping them all together, though. 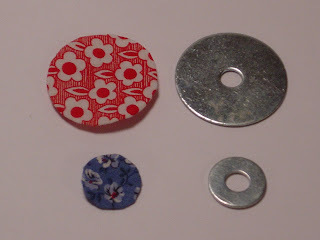 Great to use them for applique circles....will have to remember that next time I make some! 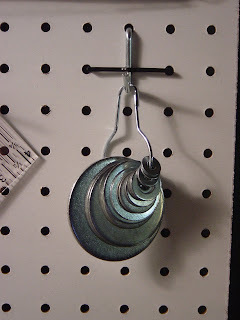 Great idea for using the washers and storing. A wonderful tutorial too! Once again, so clever. Another great tip...I love it how you look at tile and think "quilt pattern". After I had seen Grace Snyder's quilts I can understand now why someone does it. So clever! 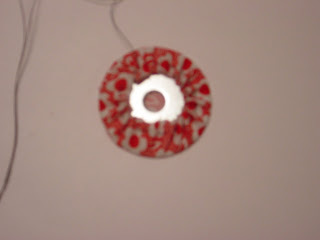 I would have never thought to use them for applique circles!!! My son actually plays a game with two wooden boxes and lg washers...similar to horse-shoes!!! Well, let me repeat everyone else- isn't that clever! 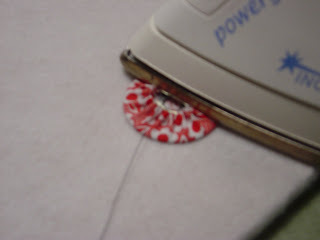 I think I'll give that method a whirl for making circle appliques. I've just signed up to make a quilt for the Italy earthquake victims(children) and a circle quilt would be a lot of fun. cool - I might have to go over to the workshop and see what is down there. Oh my gosh, how to you think of these things!! Love it! 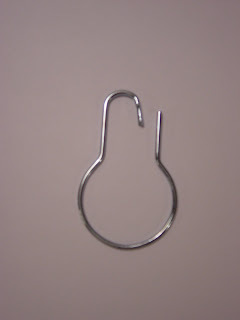 I would have never thought to use a shower curtain ring to hold the washers!!! And I love your closing sentence about being the one in the hardware store with the thread and the cute apron!!! Love it Karen!! Great idea! Karen, great idea and I'm in my sewing room trying to get organized as I type. Need a peg board. Thanks so much. How cool is that. Thanks for great ideas! Okay, now where was this idea when I was suffering through all of those circles on my silly chicken applique? Huh?! Lol, this is a great idea. I'll enjoy borrowing my new tools from Tom's supply, and I know he has some of those hanger thingies too! Wonderful idea! 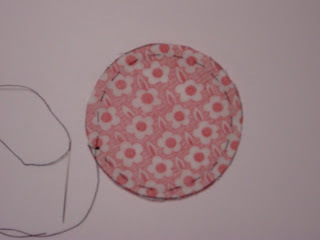 Maybe I will finally make good circle appliqués, they've always been such a nightmare before. Thank you for all your clever tips and ideas, nice of you to share. There you go again!! Love it!! Great idea! Thank you so much. Now I will have to go and find the washers. OMG this is an awesome tip!! I think my hubby has some! Yippee! Okay. I love you! I have seen the ironable templates used for making applique circles and being ever resourceful...right...I didn't want to have to actually buy them, but I love, LOVE your idea, pics and walk-through for these circles! Not only do my kids love to run their fingers through the bins of washers at the hardware store -- now Mom can actually purchase these items of intrigue. Great idea!!! 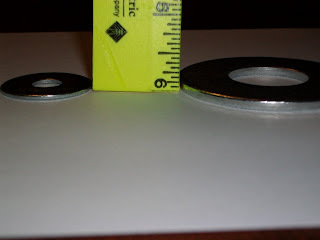 I've also used the heavier washers as pattern weights. You are so creative! Another great idea. I gave the car caddy I made to a friend at the retreat and she just loved it. I'll get around to posting it one day soon and I'll add a link back to you because I know many will want to make one. I will be making some more myself. I really appreciate you sharing all your clever tools with us. I am definitely enjoying your TTTs... no matter what day of the week I read them. I remember my ex saying "all they have to do is add the word quilt to something and the price is magnified." You are very clever, and I appreciate you sharing! Thanks again, Karen! Your TTT is great, your ideas fascinates me! I am a first time visitor and I am amazed. What a clever and inventive person you are. I will put your blog in my reading list. I'll be back for more great ideas. Thank you so much. Danke, für diesen tollen Tipp. Diese Scheiben bekomme ich auch hier in Deutschland und kann meine Applikationen damit verbesseren. Ich liebe es mit der Hand zu appliziern.